KUCHING: Dr Jessie Chung’s effort in striving to raise funds for needy cancer patients had succeeded following five full-housed Chinese orchestral concerts lately. Due to overwhelming support from the public, the organiser had decided to extend the charitable concert to 10 consecutive performances which broke the Malaysia Book of Records at the same time. To date, the first seven concerts were sold out almost instantly. Each concert has its special guests with different performances to ensure surprising entertainment values. Besides, two Malaysian young idol groups and few local television, film and stage show actors were guest stars to the meaningful event. In order to deliver limitless surprises to the audience, Dr Jessie Chung was the first Malaysian singer to deliver Malay and Japanese songs with Chinese Orchestral backup. Dr Jessie Chung also posed as a princess of the Tang Dynasty to perform with stage shows actors of “The Quatrain of Seven Steps”, Mr Vernon Tee and Mr Marcus Choot, film television star of “Unchanging Love”, Mr Tylor Chen, and his son Jeffery Beh. 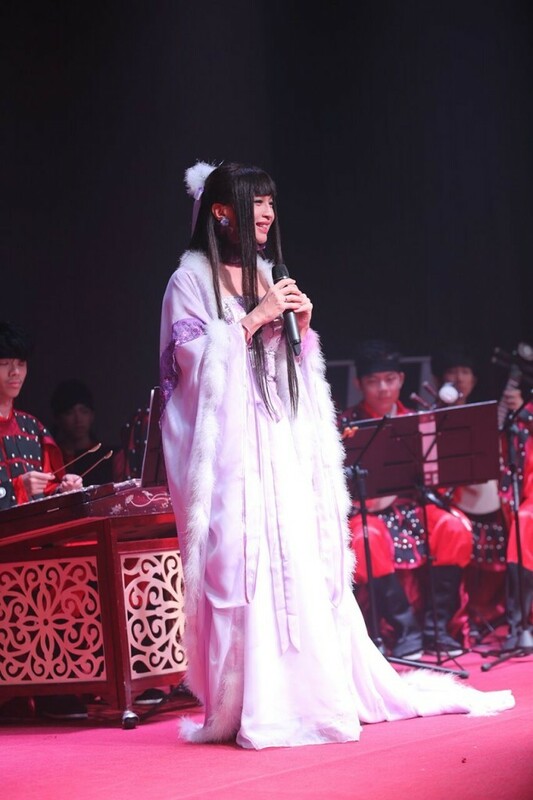 Besides singing, the audience was also thrilled by a short drama on Empress Wu ZeTian. Meanwhile, two young idol groups with the average age of 18 named Sailor and Hunter made their debut appearances and sung Dr Jessie’s songs. These youngsters really captured the hearts of women of all ages. After a feast of Chinese oriental numbers, Dr Jessie Chung sets the audience on fire by wearing a hot black and gold wonder woman outfit and delivering back to back hot new unreleased English songs from her latest English album named “There You Are”. She is scheduled to record her new English album in June in Australia and the album is expected to be released by end of this year. Entailing the successful ‘Love Unity Concert’ held on 17 October last year, the audience was once again enchanted by her well versed five languages of songs. The audience was totally blown away and responded with deafening encores and applause. Datin Maylene: I adored Jessie. She was indeed a multi-talented incredible woman who could sing and dance amazingly. Musician Zhang Guoxiang: This concert is an eye opening, unique and remarkable combination of classical and modern music. I could witness the multi-talented side of Jessie through her different bright lovely appearances and great concert content. She proved to be a very talented celebrity with unbelievable numerous additions of consecutive concerts. Musician Helen: This is a very exciting and tight concert with no time to lose. I enjoyed this three-hour show really much and it was still vivid in my mind. I was touched by Jessie’s kindness and love. I hoped more people could support her in these meaningful events to help more needy cancer patients. The first nine concerts kicked off this year at Symphony Musical Hall Kuala Lumpur on 24 and 26 March at 7.30pm and all Saturdays in April namely 2nd, 9th,16th, 23 rd , 30th April and 18th and 19th June (Saturday & Sunday).There would also be another concert in Kuching at Kenyalang Theatre on 11 June (Saturday) starting at 7.00pm. All proceeds from this concert go fully to the cancer fund. For more information kindly contact 082-574108 / 03-55693721 / 016-3366701.